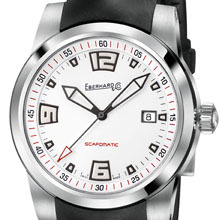 SCAFOMATIC is another of the new creations that the House of Eberhard & Co. is presenting on the occasion of Baselworld 2009.
a sporty character for great exploits! 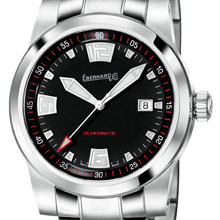 Movement: calibre 11 ½ SW 200 – soigné, mechanical with automatic winding. 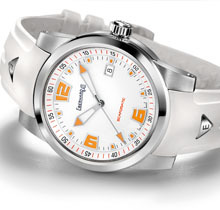 Hours, minutes, central hand for continuous small seconds, date at 3 o’clock. 1) White - Arabic numerals and indexes in relief, with orange luminescence and rhodium-plated contour; orange markers on the seconds scale of the flange. 2) White - Arabic numerals and indexes in relief, with white luminescence and oxydised contour; red markers on the seconds scale of the flange. 3) Black - Arabic numerals and indexes in relief, with white luminescence and rhodium-plated contour; red markers on the seconds scale of the flange.